For when you need an extra bed for guests to your home or if you are looking for a great camping bed – the Outwell Flock Classic King Size airbed is a terrific solution to your home or camping bed requirements. The single, double and king top-performing Flock Classic airbeds really are neat, practical camping classics. The non-slip velour top provides a soft, warm feel to the tough PVC material and features include a reliable easy-to-operate double seal valve for fast inﬂation and deﬂation. A dual-chamber double option allows individual ﬁne-tuning of ﬁrmness for ultimate comfort and stability. The King Size Outwell Flock Classic airbed will comfortably sleep 2 adults and is incredibly quick to set up and put away. The soft velour cover make this a very comfortable airbed that will both ensure your guests are well looked after at home and that you have the very best night’s sleep whilst in your tent in the great outdoors. Delivering reliable sleep comfort is central to the performance of the many options in the Outwell Flocks and Airbeds Collection to suit budgets, needs and expectations. From 3-layer single and double Flocks with a built in pump to high quality single and double Flow airbeds, all deliver home-from-home comfort for campers. 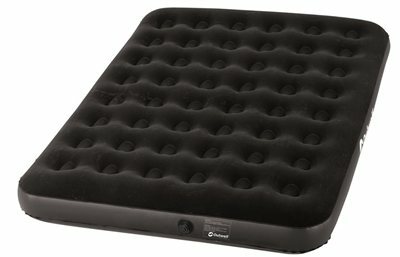 New to the collection are our luxurious Dreamland and Wonderland Airbed Sleep Systems integrating memory or PU foam toppers and zip-oﬀ quilted polyester insulation ﬁlling covers to oﬀer ﬂexible, top-performing versatile designs. Ideal for superb nights’ sleep in tents, drive-away and caravan awnings, all add new dimensions to guests’ sleeping options at home. Excellent, held up well for a weeks camping, didn't need reinflating and was warm. Was worried after reading copious number of reviews and not having been camping in 30 odd years, but was pleasantly surprised. Finally a bed got camping which is larger than a double without being the raised height variety. Made our recent camping trip so much more comfortable!!! The mattress came much quicker than expected and it seems to be good quality although we have not "put it to the test" yet. This cost only a bit more than others but once inflated, it stays inflated. Great solution for extra house guests. Double sheets fit perfectly.